An estimated 5,000 migrants are staying in temporary refugee camps near Calais, France. Most are from Syria, Somalia, Sudan and Eritrea. There are smaller groups from Ethiopia, Egypt, Afghanistan, Iraq, Iran and Afghanistan. There have been 110,000 migrants so far this year who have crossed the Mediterranean from North Africa to Italy and Greece. This isn’t a case of a passenger not paying for their ticket, we are facing systematic and massive invasions, maybe even organized ones. This is a problem of numbers, it’s not a problem of quality, it’s a problem of quantity. Regardless of the huge investment we have made and are continuing to make to protect the boarding paths, there’s a problem of quantity (of policing) when you consider the size of the first trans-Channel operator which is the Channel Tunnel. Groupe Eurotunnel says that it has invested more than $175 million in physical resources, including fences, cameras and infra-red detectors, as well as personnel. 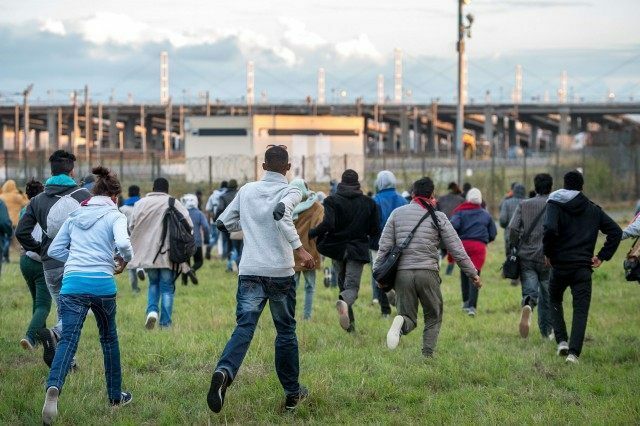 However, large numbers of migrants have been walking along railroad tracks to the Eurotunnel. Others wait until a truck (lorry) going to Britain stops for any reason, and then hides under the trailer. These maneuvers are extremely dangerous, and there have been several deaths this week. Officials have been building fences to prevent migrants from reaching the Eurotunnel tracks, but migrants cut holes through the tunnels as soon as they’re built or repaired. A chain saw can be purchased from a local hardware store for less than $50. Anybody who thinks that by erecting borders and fences in some way a particular state can be protected from alleged ‘floods’ – which are anything but floods of migrants – is living in cloud cuckoo land. We have to deal with the problem at source and that is stopping so many people from travelling across the Mediterranean in search of a better life. That means trying to stabilize the countries from which they come, it also means breaking the link between travelling and getting the right to stay in Europe. This is very testing, I accept that, because you have got a swarm of people coming across the Mediterranean seeking a better life, wanting to come to Britain because Britain has got jobs, it’s got a growing economy, it’s an incredible place to live. But we need to protect our borders by working hand in glove with our neighbors, the French, and that is exactly what we are doing. He should remember he is talking about people, not insects. I don’t think there should be any question of us sending in our army. The French themselves have got troops as well as a large police force. Kent, England, is facing financial problems for having to care for hundreds of lone children migrants seeking asylum. Kent is the British endpoint of the Eurotunnel opposite Calais, and so Kent ends up with the responsibility of taking care of the children.